ARMEX is not just baking soda. It is a specially formulated sodium bicarbonate abrasive. PARTICLE SIZE: 3 different particle sizes available, small, media and large. Most blast equipment runs on compressed air that can produce condensation and moisture which may contribute to media clumping and clogging issues. The protective additives in ARMEX are essential for uninterrupted operation, especially in high humidity environments. MoistureGuard™ 2 is in most ARMEX Formulas and makes the media about two times more resistant to moisture than regular baking soda or other baking soda abrasives. SupraKleen aids in rinsing. ARMEX Maintenance XL with SupraKleen should be used when removing coatings with the intention of reapplying a new coating, like car restoration for example. Rinsing with water following use of this product will help to remove residue from the blasting process as well as dirt, grime and fingerprints, greatly improving new coating adhesion. HydroFlex Formula contains two surfactants that work to remove greases and oils and enhance rinsing. It was originally designed to be used with pressure washer injection systems but can be used equally well in air driven systems, where water is employed during as a dust suppressant or after as a rinse. Profile XL and Turbine Formula are blending with 10% hard grit and are significantly more aggressive, increasing productivity and capable of providing a white metal finish with .5 – 2 mil profile on steel depending on the formulation. These are not recommended for sensitive surfaces and are only 90% water soluble. This is the primary reason for using ARMEX. It is inherently soft, only 2.5 on the Moh's hardness scale. When used correctly it will not wear even the most sensitive surface. For example it will not etch glass. This attribute makes it excellent for cleaning critical components with machined tolerances or detailed contours that must be maintained. ARMEX can be used without damage or distortion to most ferrous and non-ferrous metals. Architectural surfaces can also be preserved with little or no erosion to mortar joints or surface materials, be it natural stone, brick, block or wood. Additionally ARMEX can be used safely around pumps, seals, bearings, even rotating equipment without causing damage. ARMEX is a one pass media, meaning you can only use it once. It is not recyclable. This is a direct result of how ARMEX works. 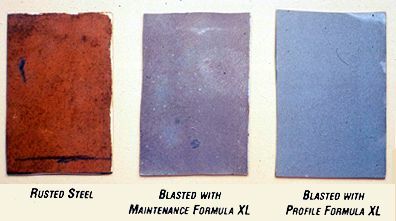 Rather than creating a wearing effect on the surface, paint, soil or contaminate to be removed like other abrasives, each extremely friable particle shatters upon impact transferring all its energy at that moment. It is actually this transfer of energy that is responsible for the cleaning or coating removal. The shattered fractions of the particle continue to sheer away the unwanted coating. All of the energy is dissipated and the media is reduced to dust. This pulverization results at any pressure whether you're blasting at 10 psi or 110 psi. Recommended soda systems run very lean, so no material is wasted and every particle does some work. The benefit of a one pass media is two fold. First because you do not have to worry about keeping media clean for reuse, you can actually put rather dirty, greasy or oily parts directly into a cabinet system using ARMEX and eliminate the pre-wash step, along with the chemical cost, time and disposal cost that are associated with a pre-wash step. You can then degrease, clean even depaint in one step with ARMEX. Additionally you never run the risk of re-introducing contaminated material to the work piece and the risk of driving that contamination into the parent material. ARMEX media is always fresh and new. The friability and water solubility of ARMEX allows for the complete elimination of particle ingression issues. Particles can be water rinsed from critical passageways and tight contours. 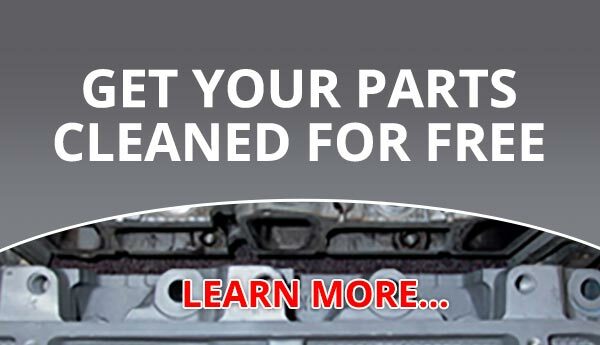 This feature also frequently eliminates the need for some disassembly, or masking, and therefore reassembly or masking removal, save yet more steps. Combining the previous attributes of softness, friability and water solubility ARMEX causes no pitting, peening, or crack closure on the surface, providing an excellent prep method for any type of physical inspection treatment. The benign nature of ARMEX minimizes waste disposal concerns. All waste disposal requirements are dictated primarily by the volume and content of the coating removed. Hazardous coatings may require special handling. Having been tested, benign dry waste, including spent ARMEX, can be disposed of as non-hazardous industrial waste, and sent to a sanitary landfill. Unlike other abrasives that bond with the coating or contaminant being removed, ARMEX water solubility allows for separation from the contaminant in a water solution. If an effluent wastes is preferred, partially solubilized non-hazardous waste can be further solubilized and filtered for disposal. ARMEX is completely non-toxic and non-hazardous (per EPA and OSHA regulations). It is also approved by the USDA as an A-1 Cleaner for use in food processing facilities or FDA regulated facilities.